There’s no way around it: facing our own privilege is uncomfortable. Just now, before completing this piece, I was talking to a friend who told me, in so many words: “I am ashamed of being a man, and I am ashamed of being white.” He is far from alone in this discomfort. Because we live within modern, capitalist cultures which are highly individualized, we often don’t see the structural dimension. Many of us then struggle to separate out privilege from attitude. In this context, having our privilege pointed out to us often sounds like we are being told we’re a bad person. This makes conversations about privilege highly charged and often ineffective. After almost two years of facilitating Facing Privilege calls, I have come to believe that something better is possible. We can frame things in a way that shows the reality of structures of privilege and minimizes any unnecessary challenge. It starts with recognizing and naming that since privilege is structural and not individual, it has nothing to do with goodness or badness. It’s plainly a factual reality about life. The key is to focus on two distinctions: systems as distinct from individuals, and having privilege as independent of choosing how to engage with it. Since both of these distinctions tend to be obscured, I have found that people often find relief in teasing apart these two aspects of privilege. When I talk of privilege, I am referring to forms of access to resources that result from legal or social norms having to do with membership in a group, independently of any particular action, inaction, or even awareness on the part of the people who have that access of the existence of the disparity, the potential benefits to them, or the costs to others. Privilege is societally given, not chosen, and is independent of attitude or belief system. 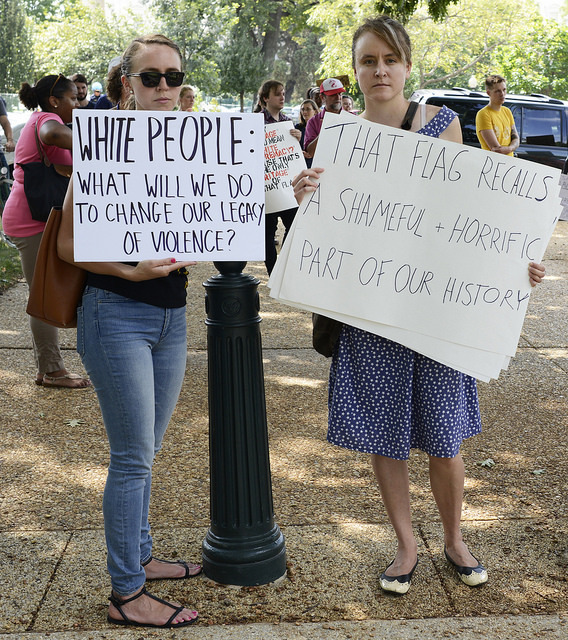 Believing in equality between the races in the US, for example, does not cancel the privilege of a white person. At the same time, having structural privilege often leads to certain behaviors through socialization, normative models, and the tendency to justify privilege that has existed in human societies since social stratification started around the time of agriculture. Although there are forms of privilege that can be acquired (wealth and education are key examples), most of us acquire most of the privilege that we have before we are even born. Moreover, we don’t have much choice about whether or not to have the privilege. If I were to come from a super wealthy family, for example, I could conceivably give away my entire fortune. That wouldn’t do away with the way that the privilege I was born into affects who I am. I would be way more likely, still, than someone who grew up in poverty, to have levels of education and manners of behavior, thought, and attitudes that are likely to land me a decent job or the capacity to create a successful business which, once again, would put me in a position of greater material wealth than others. In addition, as Assata Richards, a community organizer and participant in a recent class, said, “What privilege means is that effort and activity have different returns for different people based on the privilege structures in our society.” Hard work, the cornerstone of the belief in a meritocratic society, doesn’t guarantee anything and only works at all in so far as systems of privilege allow it to. We cannot run away from having privilege once we have it. The only choice I believe we have is how we engage with the privilege that we have. I have so far identified four negative ways of engaging with privilege, and four positive ways of engaging with privilege. Although I catalog below four distinct ways of engaging with privilege, in actual reality, they are often intertwined and blend into each other. I still find value in understanding, and supporting others in understanding, the differences between them and how they contribute to the perpetuation of systems of privilege. Denial/Invisibility. One of the ways that systems of privilege continue to be transferred from generation to generation is by making the existence of the privilege invisible. What’s rendered invisible is both the gap between the experiences of those with privilege and those without it, and the relationship between the two. In the context of a commitment to equality and meritocracy, the latter in particular is obscured. It is easy, for many, to think that if others applied themselves, they, too, could reach wealth. Or, seeing how some few darker skinned individuals have “made it” economically or politically, to extrapolate to a claim that there is no more racism and that claims to the contrary are based on personal lack of taking responsibility, or lack of willingness to accept the results of fair play. Denial contributes to systems of privilege by reducing the chances of people having conscious choice about what to do with their privilege. Guilt/Shame. In the same way that lack of systemic perspective can easily lead to denial, so guilt and shame can emerge from the blending of privilege and attitude. Many people find it nearly impossible not to equate their own access to privilege with a sense of personal badness, a moral failure, when opening up to hearing about the reality of structures of privilege that benefit some at the expense and suffering of so many others. For example, in some segments of the population, people experience shame if they inherited large amounts of money and others in their communities are struggling, and they end up hiding the fact of their wealth from others. This association of tragedy with moral judgment is directly an outcome of a culture steeped in right/wrong thinking rather than focusing on human needs and how best to attend to them. 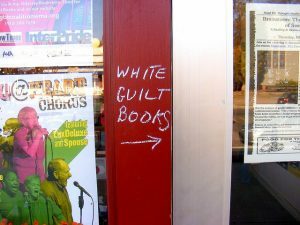 Guilt and shame contribute to the continuation of privilege because they are paralyzing feelings that keep us spinning within them rather than mobilizing us to take action, individually or collectively. Defensiveness. Because of how vulnerable to judgment and self-judgment we are, and how easy it can then be to hear blame and judgment regardless of whether it’s there, defensiveness is almost a “natural” response as a way to counteract the possibility of shame and guilt: if I can “prove”, at least to myself, that I am a good person, then I don’t have to look more closely at the privilege, or listen to what others are telling me. This is why in so many conversations related to privilege, those with privilege focus attention on their intention and on being misunderstood, while those without the privilege try, often unsuccessfully, to focus attention on the effect of the privilege or of unconscious behaviors that emerge from having the privilege. Defensiveness contributes to the existing system by keeping the focus on the individual level, and, specifically, on the person with privilege. Meanwhile, the attempts of those without the privilege to call attention to it, to open up a conversation, to mobilize to take action, or in any other way to create change, go unattended. Entitlement. In a world structured around scarcity, everyone is scared to lose. In a stunning piece of research, many multi-millionaires were asked if they have enough. Most said no. On average and across the range of wealth in the sample, they said that having 25% more than they had would be enough. After the initial shock of finding out this information, I am no longer surprised. When we don’t trust that our needs can be met in and of themselves, we are pushed to come up with justifications for why we deserve what we have, and hold on to it as tightly as possible. When a friend of mine and her two sisters confronted their three brothers after discovering a trust in the family that distributed money to all living males whenever someone died, their brothers uniformly stated, simply, that they weren’t the ones who set it up. With that, they were satisfied to keep the money instead of seeing that they each could divide it with one sister and then all would have access to it regardless of what the trust says. The sense of entitlement contributes to the persistence of privilege in direct ways by keeping those who have the privilege from being able to be creative in their use of it. For each of the negative ways of engaging with privilege, I have a found a positive way that moves the person engaging it into more freedom and choice. In addition, if enough people engaged in the ways I describe below, perhaps a larger shift would become possible. Owning the privilege. Time and time again I notice just how simple and strong it is to own and acknowledge my privilege where I have it, and to do so without guilt and shame. When I do it, there is almost invariably deep and sometimes overwhelming sorrow. Sorrow, as big as it can be, is soft. It joins with life rather than fights against it through denial. Once denial is traversed, recognizing what is true releases energy that was blocked in the hiding, and makes it available for connection and for choice. Learning about privilege. When I came to the US in 1983, I knew absolutely nothing about privilege. I was aware of racism, which made absolutely no sense to me as a foreigner and immigrant to the US. It took some years before I was exposed to people and groups that were looking deeply at social differences and their effect. Then, in 1991, I took a course on race and ethnicity in the US as part of graduate studies in sociology, and wrote a paper about racism in the women’s movement which was an accelerated immersion in the topic. Since then, it’s been a steady experience of learning more and more about the historical roots of race privilege in the US, and I intend to keep learning for as long as I read at all. In some ways, it’s easier for me, an outsider, than for white people born in the US to approach the topic. I don’t carry the weight of guilt that growing up in the US leads so many whites into. It is not my ancestors nor the structures created by them that have established what is happening. Similarly, I learned about the extent of the dispossession of Palestinians that was part of establishing the state of Israel when living far away, once again making my task easier than it is for those living right there, facing the reality in the most visceral way. So I may be limited in my ability to imagine what it would be like for people with privilege being born into it and living in its direct context. I can only say that I have seen many times how learning about the history of privilege and of its structural nature relieves people from the suffering of guilt and shame. I suspect this is because the personal element becomes less pronounced as the magnitude of the larger issues is exposed. In addition, learning about any particular privilege any of us has, within the particular society or culture we live in, gives us an entryway into understanding the particular ways we may unwittingly reinforce structures of privilege in our most mundane actions. That, too, increases choice and reduces the chances of inadvertently acting in harmful ways. I can’t imagine that not being liberating. Opening to receive feedback. Perhaps the most difficult discipline of engaging with privilege is that of choosing to do whatever it takes internally to be relaxed and open to hear feedback from a person who doesn’t have the particular privilege that I do. Much of my learning about the topic of privilege, especially as it relates to race relations in the US, came through friends and students who were willing to speak truth to me across lines of power difference, sometimes two (both race and my position as a leader). This is very hard work. And I know its value and necessity. When I am the person with privilege, I am way less likely than the person without the privilege to notice the dynamics of power. Because of that, and especially in times of conflict, I would almost always want me as the person with privilege to commit to hearing and opening to all feedback even when I am utterly convinced that whatever upset the person is experiencing is based on misunderstanding my intentions. Why? Because focusing on my intentions before focusing on the effect of my actions reinforces the structures of privilege. I have compassion for the many times I do not succeed, because I know how strong is my need, anyone’s need, to be seen and understood. And this compassion is not about getting me off the hook, only about motivating me more fully. I am always committed to this even when I am not successful. I want to get better and better at holding gently my need to be seen, breathing with it, and letting go of having it met, at least for a while, while I make myself available to those who don’t have the privilege that I have. The freedom that comes with this willingness is the freedom of choice about my own needs. One of the core practices of inner freedom that I am aware of is precisely the capacity to live in peace with unmet needs, because it is when our needs are not met that we are most likely to lose choice. Being able to sit with unmet needs means having more choice, more capacity for freedom and nonviolence. Stewarding privilege for the benefit of all. The last of the four positive ways of engaging with privilege that I have found is a deep and conscious shift from possessing to stewarding my privilege. Instead of automatically and reflexively assuming that the privilege is “mine” and the benefit of having it goes to me, this change in attitude puts me in a position of seeing the privilege as belonging to the whole and seeing me as its steward for the benefit of all. A whole new vista of possibilities opens up when this shift begins. I’ve engaged quite a number of people now with thinking proactively about what resources they have, how they are using them now, and how they might want to use them for the benefit of all. So far, people have loved this activity, and have felt inspired and lighter after doing it. Going through this simple activity myself is what led me to begin the Facing Privilege calls, and then to doubling their number to twice a month. It was immediately after Darren Wilson was acquitted after killing Mike Brown in Ferguson. I already had the frame of using my privilege for the benefit of all, and I didn’t know what I could do in that instance, when I so wanted to do something. Upon reflection, I realized that one of my privileges, an acquired one, is access to a small platform and a small following, and that I could use that privilege to do the work of moving, however minutely, in the direction of dismantling the system of privilege. I could open up conversations about privilege that would be loving and fierce. I have never looked back. These conversations are some of my most cherished moments of every month. My internal willingness keeps growing to engage, to challenge myself and others, to reach across divides, to make messes by trying to offer support, to name things that others may not feel up to looking at, and to put myself overall in more and more uncomfortable positions. The willingness to experience discomfort is essential for shifting from the negative to the positive ways of engaging with privilege. The positive path doesn’t eliminate discomfort. Indeed, I don’t know any way in which any of us in a position of privilege can wake up to it without experiencing discomfort. The question for me is not whether or not there will be discomfort; only what kind of discomfort. My way of understanding the deepest source of the discomfort emerges from my faith in the human spirit. I believe we are all born with an innate capacity for care and from it with the desire to contribute to life around us. Because of that, the way we usually explain to ourselves implicitly why we have privilege is by denying that we have the privilege and at the same time thinking that we deserve it. Both ends of this illogical position combine to provide some ease in relation to our fundamental care. To suddenly recognize that there really is no reason for us to have it other than that’s how society is structured puts us face-to-face with the reality that our privilege is at the expense of other people. This spells a moral contradiction that I see as the root of the challenge of facing privilege. We cannot protect ourselves and others from this discomfort because the existence of systems of privilege is, indeed, at odds with our basic inclination to care for everyone’s needs. This discomfort, the anguish of truly seeing how much of what provides comfort, ease, material resources, access, and more to some is at cost to others, doesn’t go away. It can’t go away for as long as the systems we have in place are what they are. Nothing else would bring an end to the excruciating and growing disparities that exist in the world in terms of access to resources of all kinds. That anguish, when faced fully, becomes a source of energy fueling work for transformation. I find it generative and useful. The unnecessary discomfort stems from making a systemic issue appear to be an individual failing. When the word privilege is either used or heard as a statement about the moral character of the person with the privilege, it tends to bring about shame and defensiveness, both of which interfere with learning. Given that many of us want to make the reality of systems of privilege known, I find it important to remind myself that we become more effective the less shaming and the more fierce tenderness we can bring to the topic. Then we can find ways of supporting all of us in staying present as we look at the untold suffering that exists in the world because of massive differences in power, so that we can truly come together and create change. There are no guarantees, because anything that anyone says, no matter how skillful, can still be filtered through the experiences of the listener into something that is far from the original intention. My hope is that we can find a way to do this collective awakening with only the necessary and unavoidable discomfort, and not more. This, to me, is one of the core tasks facing us if we are to still find a way to turn around the march towards destruction that’s only been accelerating in my lifetime. Because of how easy it is to fall into self-blame and shame, I am actively excited about focusing on how much liberation for self there can be in engaging with privilege. I have no hope of transforming the world if people engage with privilege out of obligation. Instead, I want to both remember and to effectively show others that having unexamined privilege and unconscious or reactive ways of using it is at cost to all, not only those without privilege. The cost is drastically different, and still it affects us all. In this context, I experience dedicating my resources for the benefit of all as the most liberatory of all the positive ways of engaging with privilege. It challenges the heart of the system: a privileged person’s ability to protect themselves from discomfort. By willingly taking on discomfort, I begin to free myself from attachment to the privilege. As I do that, more and more, I live in more integrity and less fear at the very same time as contributing to others and to transforming the systems of privilege, even if minutely. Less separation all around. This entry was posted in Uncategorized and tagged feedback, Privilege, shame on November 26 / 2016 by Miki Kashtan. I remember the first time I heard you distinguish the notion of stewarding privilege on one of your Facing Privilege Calls, it was a revolutionary moment in my life. It has since brought into question the notion that anything is really “mine”. This is still something I grapple with. I can say that I have since noticed myself performing acts of generosity that I wouldn’t have done prior to your distinguishing the notion of stewarding privilege for me. Thank you for doing the work yourself to clarify these ideas for yourself and for the clarity in which you communicate to others what you have discovered. I consider this to be a way that you are stewarding your privilege of your intelligence and your brilliant and rigorous way of thinking. Thanks sooooo much for this! The first piece I’ve read which is really clear and helpful about how to actually engage with privilege and work WITH it. Your suggestion of stewarding, “seeing the privilege as belonging to the whole and seeing me as its steward for the benefit of all”, is similar to my own recent discovery/understanding about power: that really the only fully workable use of power is when I use power for the good of all who are impacted by it – which of course includes myself. I need to use power to benefit me – otherwise I become depleted, ineffective, and possibly resentful/needy/manipulative. Alongside this, though, when I benefit me more than others then ppl need to protect themselves from my power and so I become isolated. Each signal – protectiveness/isolation and depletion/resentment – is useful as guideposts to keep me on the course of using power for the good of all. Wow! So much to learn from just this one piece. I always felt guilt having access to education which brings a cultural privilege…growing up in a country where this access is a luxury. Knowing how to work with this based on what Miki shared is so,so helpful! Thank you for this article which seems to me to be full of powerful ideas. I think that the choice of being truly open to feedback and the notion of choosing to temporarily suspend one’s urge to fulfil an unmet need (as a person with privilege) are particularly crucial. A question that has arisen for me towards the end of this piece relates to this sentence: “Instead, I want to both remember and to effectively show others that having unexamined privilege and unconscious or reactive ways of using it is at cost to all, not only those without privilege.” I’m imagining a person who is very much unaware of their privilege and perhaps unaware, or barely aware, of the discomfort you talk about, the discomfort that comes with realising that there is no real justification for one’s privilege. My question is: do you have any thoughts on how you would demonstrate to a person like the negative effects of privilege on their own life? How can you bring someone from that point towards a place of being willing to engage with the idea, partly for their own benefit?